US President Donald Trump said he discussed trade issues with Vietnamese Prime Minister Nguyen Xuan Phuc during a White House visit on Wednesday and that the two countries had signed trade deals. Vietnam's Prime Minister Nguyen Xuan Phuc and United States President Donald Trump were expected to unveil economic deals worth up to US$17 billion (S$23.5 billion) at their meeting in Washington yesterday, the visiting Premier said. Technology imports by Vietnam would be a particular focus of the deals, said Mr Phuc, who is the first South-east Asian leader to visit the White House since Mr Trump took office. The two leaders were scheduled to meet for half an hour and speak through interpreters. Earlier on Tuesday, US Trade Representative Robert Lighthizer met Vietnamese officials to settle agreements ahead of the summit, which may see Vietnam buying more American aircraft. "Vietnam will increase the import of high technologies and services from the United States, and on the occasion of this visit, many important deals will be made," Mr Phuc said at a US Chamber of Commerce dinner on Tuesday evening. He pledged continued domestic economic reform, and said Vietnamese companies would be encouraged to invest in the US. General Electric (GE) Power chief executive Steve Bolze said GE would sign new business deals worth about US$6 billion with Vietnam. He gave no details but emphasised that GE had 3,000 employees in Vietnam. "All of us have vested interests in ensuring that US-Vietnam relations are friendly," he said. Vietnam will increase the import of high technologies and services from the United States, and on the occasion of this visit, many important deals will be made. VIETNAM'S PRIME MINISTER NGUYEN XUAN PHUC, on building closer economic ties with the United States. Separately, journal Tech in Asia reported that the Vietnam-based Internet company VNG Corp, which provides online games, music streaming and messaging applications, signed a preliminary deal on the sidelines of Mr Phuc's two-day visit, with the US stock exchange Nasdaq to explore an initial public offering. VNG and airline Vietjet may be the first Vietnamese companies to list overseas. Mr Lighthizer at the same dinner event noted: "Over the last decade our bilateral trade deficit has risen from about US$7 billion to nearly US$32 billion." This "presents new challenges", he added. Key American exports include electrical machinery, aluminium, aircraft, cotton and machinery,the USTR website states. Vietnam is America's 10th largest agricultural export market. The US-Vietnamese relationship has been solidifying. Diplomatic relations were normalised in 1995. In January 2007, Vietnam became a member of the World Trade Organisation. It is now the sixth largest source of foreign students in the US, with close to 30,000 Vietnamese studying there. A year ago, the US lifted a decades-long ban on weapons sales to Vietnam, and last Thursday it transferred a Hamilton class cutter to the Vietnamese Coast Guard, which is now its largest vessel and will significantly improve its maritime capability. Vietnam has overlapping territorial claims with China in the South China Sea. But Vietnam was shocked by President Trump's withdrawal from the Trans-Pacific Partnership (TPP), and is eager to enter bilateral trade negotiations, analysts say. Vietnam also wants the US to recognise it as a market economy. "Vietnam is desperate not to be a victim of Trump's effort to correct US trade imbalances," said Mr Carl Thayer, Emeritus Professor at the Australian Defence Force Academy of the University of New South Wales in Canberra, in an e-mail. "Vietnam lies sixth on the list of those with a trade surplus, but Vietnam's 30 billion plus surplus is a fraction of China's surplus. 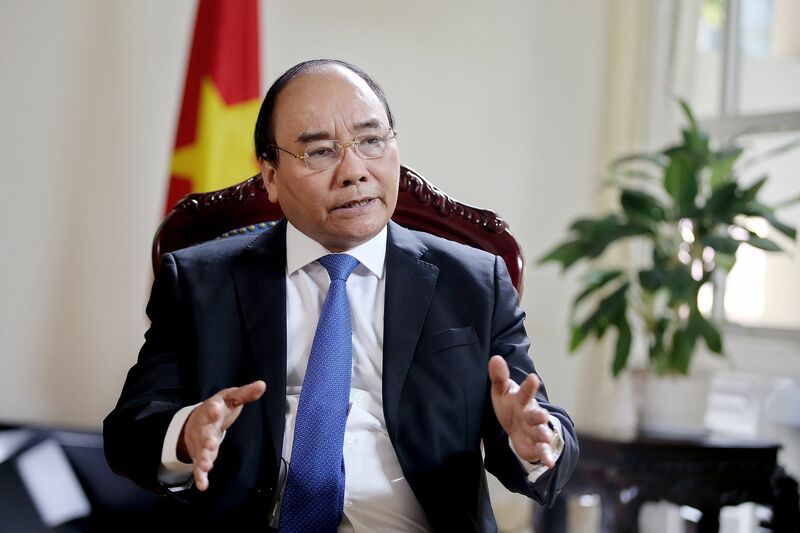 Vietnam needs access to the US market and… Prime Minister Phuc and other leaders have signalled that they are willing to work with the US to negotiate a bilateral free trade agreement." Mr Thomas J. Donohue, president and CEO of the US Chamber of Commerce, said at Tuesday's dinner: "With the US withdrawal from the TPP, we must find new means for achieving greater levels of trade and investment between our nations. "Comprehensive rules based (on) economic cooperation in the Asia-Pacific has not disappeared and is not going to."